Chainring bolts are an essential part of every bicycle- they secure the chainring of the bike to the crank arms, allowing the user to transfer force from the pedals to the rear wheel. However, these small and fiddly bolts are prone to stripping, and currently no tools are well designed enough to not make the removal process a chore. After coming up with an idea on paper it was quickly translated into a physical form that could be tested. I find making things, even if the idea isn't fully resolved yet the best way to come up with new ideas, and to see flaws you may not have been able to conceptualise. A socket extension was modified, the end roughly milled into an appropriately sized end piece for the tool I envisioned. The tool worked well on some bolts, but not on them all. The height of the middles slot was too high, pressing against the allen key inserted into the other side. I visited a local bike shop to garner some feedback on its usefulness, and overall design. The tool needed to be compatible with the two different sized slots currently found on the backs of chain ring bolts. Although effective at removing the bolt, it wasn't comfortable to hold, and the design of the ratchet didn't allow the user to apply much force pushing the tool into the slot. I realised that the tool would slide much more securely into the chain ring bolt if the central protruding piece was round in profile, to be a diameter close to that of the internal diameter of the bolt. The entire length of the tool piece was shortened, to reduce the chance of any unwanted pivoting as pressure and torque is applied. The teeth were also made thinner, to accommodate bolts with a thinner slot- although as they weren't tapered due to my basic milling abilities this rendered them quite weak. The tool piece fitted in the slot, with the face of the tool touching the back of the bolt. This provided a much more stable platform to push against. However, the teeth were too thin, causing them to slip out of the slot when large amounts of torque were applied. I observed that the mechanic had to push very hard against the back of the socket with his palm, which when asked he admitted was uncomfortable to do. Although the tool did remove the bolts, it didn't do so particularly efficiently, (or comfortably!) for the user. The form of the handle needed to be changed. The large lever isn't necessary, and more force would be required pushing the tool into the bolt to use it effectively. Bulk is difficult to manoeuvre if bolts are taken off whilst the crankset is still on the bike. Extremely comfortable to hold. Provides the user with a large mechanical advantage. Design makes it tricky to line up the slots, and also make it difficult to apply force to hold the tool piece in place. No protruding handle to get in the way when held in certain positions. The shape is not very restrictive, and can be held in a number of ways. From feedback regarding the handle of the tool, a prototype of the handle was made. Informed from my research a cylindrical handle profile was chosen, the initial prototype being epoxied into the centre to create a functioning tool. Anthropometric data from the free DINed database helped me choose a diameter that would be grippable by the most common demographic. I revisited 2 bike shops in Oxford, as well as recycleabike in Uxbridge, to let the professionals use the tools, and to give me their 2 cents. The handle allowed the user to apply enough pressure to the part to provide a secure connection. I noticed that the user had to look at the tool piece of the tool to line up the teeth with the slots in the bolts. Although the tool worked well, it was overly bulky. PP4- Smaller Handle, Better experience. The overall diameter of the handle was retained, but huge amounts of excess material were removed. A slot was added on the top of the handle as a visual signifier of the orientation of the slot. This made lining up the teeth a much more straightforward process, provided the retool piece was attached in the right orientation. Magnets were experimented with (concealed in the handle) to aide the user in picking up and retaining the bolts for insertion. However, online research showed that most high end bolts were aluminium, and I didn't want to push the consumer into habits that would only work of specific (steel bolts). Mahogany was used as a handle material (as opposed to the beech in the first prototype). This was purely to test its performance. However, it was much more affected by stains from the users hands, and felt less resistant to wear and tear. The reduced size made the tool easier to manoeuvre, and it worked very well removing bolts. The handle was used in conjunction with a tool piece with much wider teeth to grip the part more securely, that were also more shallow to allow the back of the bolt to sit flush with the flat face. Now that the size of the handle was in a good place, I wanted to ensure that although simple, the assembly process was as straightforward as possible, utilising standardised parts where possible. The handle piece was boiled down to three parts. These form a strong sub assembly that can withstand large amounts of force, and can be easily disassembled for maintenance (or replacing the wooden grip). The bolt that secures the tool piece in the handle is a standardised size, and can be removed with the same size allen key commonly used on chainring bolts. Talking to one of the mechanics in Walton street cycles, she said she often offset her strength when removing tight components by clamping the tool or component in a vice. She could then use the whole length of the component as a lever. I reasoned that if the tool could also be clamped in a vice, it would allow the user to apply huge amounts of force if really needed, using the crank arm as a lever. Creating an additional part for this purpose seemed unnecessary, and I realised I could achieve this by milling 2 flats on the tool piece. This also acts as a visual signifier of the orientation of the slots. The 2 flats don't extend to the tip of the tool, preventing it from falling into the vice when tightening, as well as providing an area that can be gripped for easy removal from the handle or a vise. The vice securely gripped the flats, the large surface area providing a solid connection not prone to twisting, and allowed bolts to easily be removed. If someone picked up the tool for the first time, I wanted the way that the tool piece removed from the handle to be instantly intuitive. Looking at the semiotics of different bottle tops, 2 filleted sections were added between the flats and larger diameter section of the tool that the teeth are on, as well as using 2 grooved sections on the body helped convey how the tool was removed. Whilst in the shops, I noticed that most mechanics displayed their tools on a pegboard like display, as opposed to keeping them in drawers. I wanted to create a piece of packaging that had a life after the product had been bought. Several iterations were made in foam board, and a final design was selected. 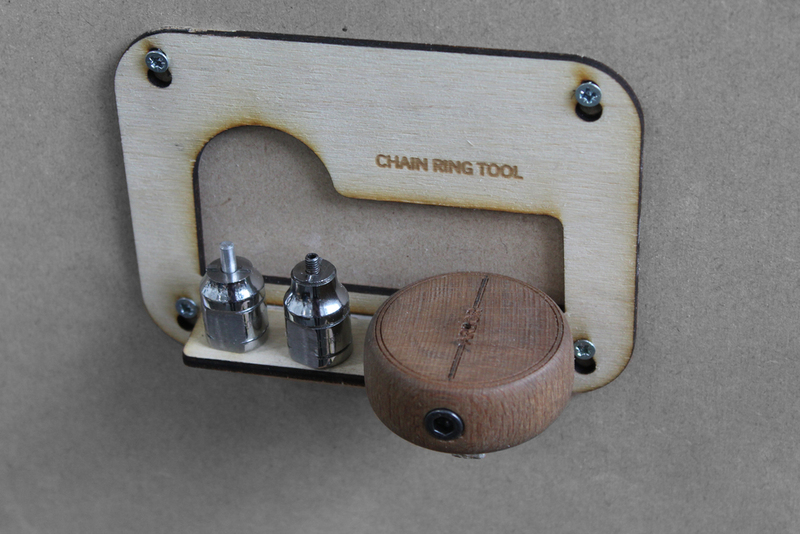 The final design consists of a small piece of laser cut plywood that the tools come affixed to. This is initially flat, to save on shipping costs. The consumer then pops out the prospective parts, which assemble with no tools into a functional wall storage unit. The cutouts from the screw key hold become small mounting pieces for the tool pieces, further minimising waste. A similar design could be injection moulded out of polypropylene and utilise live hinged to fold the part into a 3D shape. Part of this school based project was brand integration. For us, this involved similar typefaces, materials, brand ethos (focusing on the circular economy) and standardisation of parts. Laser engravings of different styles were tested on samples of beech, both for aesthetic reasons and to see how the change in texture would affect the grip of the handle. Through the laser etching process, a useable QR code was added to the handle. When scanned, it takes the user to a page regarding the origins of each part of the product, and how it can be recycled. The branding also acts as a visual signifier, informing the user of the orientation of the slots without them having to look. The handle centre piece has a blast etched line on the exterior that corresponds with a laser engraving on the handle, making lining up the two quick and easy. The final handle is crafted out of beech, and finished with linseed oil. Beech is one of the more sustainable timbers, that "with careful planning and resettlement operation is almost exhaustible" (Dimaflex). This is backed up by forestry.go.uk, who state that beech is one of the UK's only sustainable timbers. It was important to me that the product would theoretically be manufactured in the UK, and this not only keeps revenue in the country, but also reduced shipping costs. Linseed oil is a natural, organic finish that is simply rubbed on, and actually impregnates the pores of the wood. This requires very little maintenance, and allows the user to still feel beeches distinctive grain. Several different finishes were trialled, and it was decided that the linseed oil gave the best overall appearance & handle feel. The part can be laser engraved after the oil has been applied (and dried). This makes manufacture more easy, as the parts can be fully assembled and indexed using the central handle piece before laser engraving, preventing manual lining up of the handle. I should take this moment to thank all of the shops I collaborated with, particularly Recycleabike, for allowing me to barge in, listen to my thoughts, and take the time to try out the prototypes. If you're not familiar with Recycleabike, check them out at www.recycleabike.co.uk . It's a fantastic bike shop run by NHS Personal Fitness trainer Nick Gore, and focuses on rehabilitating those with mental health conditions. I have thoroughly enjoyed this project, and look forward to taking it further in the future. This photo essay documents most of the main steps of the design process of the product thus far, ultimately it will need some refinement to become a viable commercial product, but I have every intention of making it a reality.